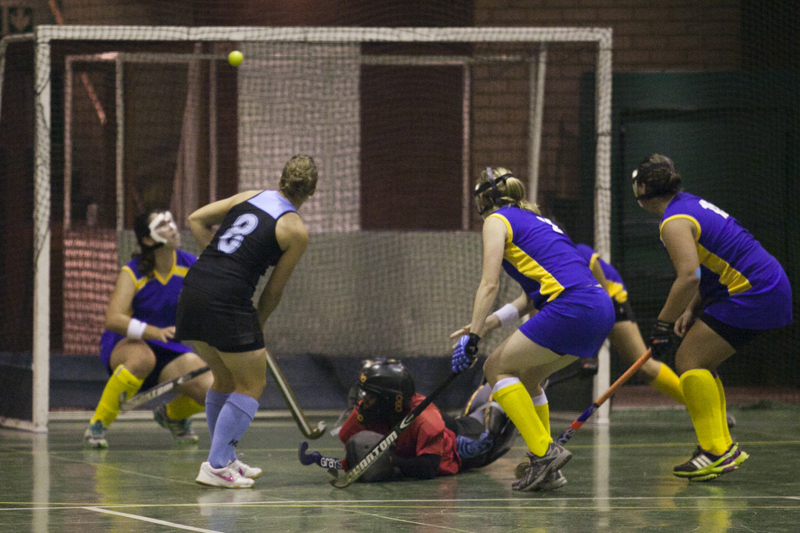 Shooting High: The Wits Hockey Women, in blue and yellow, watch as a shot by Jeppe St Andrews midfielder Jules Cass, in black and blue, goes toward the goal. Wits lost the game 6-3. 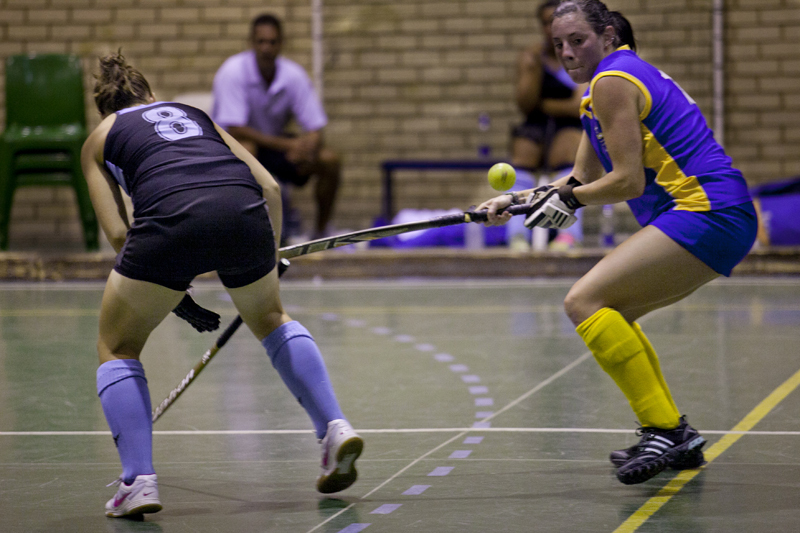 The Wits Hockey Women lost their second Indoor Premier League match 3-6 against Jeppe St Andrews at the Fourways Indoor Stadium on Monday night. Wits got off to a good start at the beginning of the game. They produced a number of neat plays along the board and managed to get behind Jeppe’s defence to test the keeper. The pressure continued to build for the Witsies and within the fourth minute Wits were rewarded with a penalty corner. Witsie and former South Africa U21 defender Demi du Toit stepped up to slam home a drag flick from the top of the D to put Wits up 1-0. Jeppe managed to shake off the goal and soon after began to turn the tide against Wits. Wits conceded a number of interceptions along the forward line which allowed Jeppe to counter attack in force. This proved too much to handle for the Witsies as they conceded a pair of penalty corners. In the 11th minute Jeppe’s Roxanne Turner drew the sides level with an un-saveable drag flick in the bottom right hand corner. Jeppe’s Jules Cass, a former Wits student, added another goal from a penalty corner in the 15th minute. One minute before halt-time, Wits manage to scrape the scores level after Witsie striker Jaime Martin found a gap in Jeppe’s defence to set up an easy tap in for Wits’ Gabirela Garcia. During the second half Wits struggled to get the ball out from their own 16 yard hits, this was mainly due to a change in strategy from the Jeppe side who stepped higher in defence preventing most of the ball getting to the Wits forwards. Jeppe showed great composure and awareness and pulled any chance of a victory away from Wits. In quick succession Jeppe scored two goals in the 22nd and 25th minutes to put Wits 4-2 behind. Wits came back with another goal from Du Toit in the 27th minute, this time taken from a penalty stroke. Wits goal keeper Zimisile Shange was peppered with a number of shots from all corners of the D. The students were lucky to leave just two more goals unanswered in the 29th and 33rd minute as Jeppe put the score line to 6-3. Wits coach Peter de Lange threw in one final gamble by replacing Shange with an extra outfield player with three minutes to go. The change in strategy was ineffectual in returning a goal but did manage to stem the flow of goals as players were able pick up loose unmarked players. After a comfortable 5-3 win last week Wits’ hopes of keeping with the top competitors in the league took a major knock after the loss. 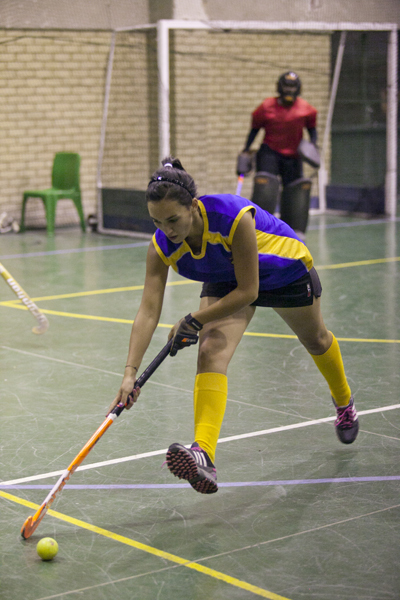 Gabriela Garcia watches the ball lift off a Jeppe St Andrews player.